I've been so busy lately that I've been neglecting my poor little blog. I already missed last month's "You Want Pies With That?" and sadly I couldn't get my act together to participate in this month's event either. I feel particularly bad about it since today is Pi(e) Day (as in 3.14). So I’d like to apologize to my fellow YWPWT participants. I will definitely get back to making pie next month. I did manage to throw together this carrot cake though. Spring is right around the corner and spring reminds me of bunnies and bunnies eat carrots. So I guess you can say I've just had carrots on the brain lately and there was a bag of organic carrots in my refrigerator calling out to me. I used a recipe from Dorie Greenspan's "Baking From My Home to Yours" and tweaked it a little bit. I scaled her recipe down to make a shorter (two layer) cake instead of a taller (three layer) cake. Also, I replaced some of the granulated white sugar with brown sugar to add a bit of that molasses flavor, decreased the amount of cinnamon and added some orange zest. I really liked Dorie's addition of shredded coconut to the cake batter. I adapted a Martha recipe for the frosting. 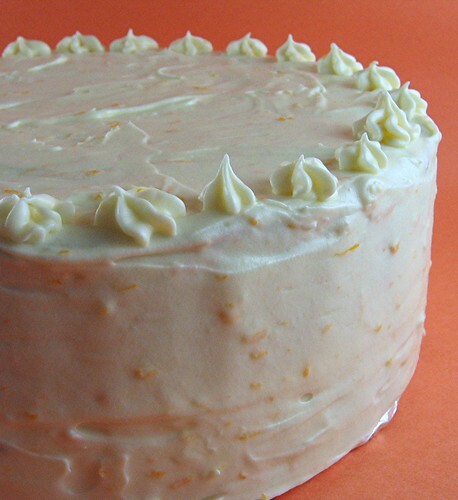 The addition of orange juice and zest to the frosting really brightens up the flavor of your typical cream cheese frosting and pairs nicely with the cake. Everyone, including me, really liked the cake. It was moist and flavorful and not at all dense and the frosting was just sweet enough. 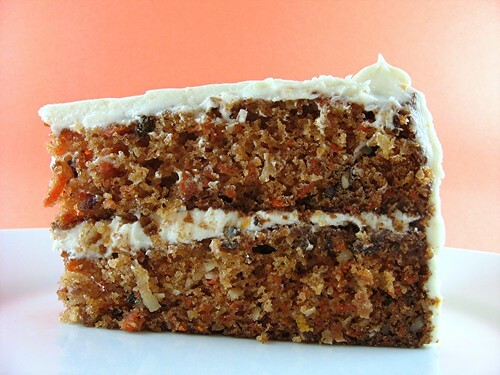 I was a bit surprised with how many people said to me "I don't normally like carrot cake...but I love this one." My response to them was "I guess you don’t like bad carrot cake." Preheat oven to 350F. Butter two 9x2-inch round cake pans, line the bottoms with parchment paper and butter the paper. Sift together the flour, baking soda, baking powder, cinnamon and salt. Set aside. In the bowl of a stand mixer using the paddle attachment, beat both sugars and oil together on medium speed until smooth. Add eggs, one at a time, beating well after each addition, scraping down the sides of the bowl as necessary. Add vanilla extract and orange zest and beat batter until batter is smooth. On low speed, add the flour mixture and mix only until the dry ingredients barely disappear. On low speed, mix in the grated carrots. Then remove the bowl from the mixer and, by hand, gently mix in the nuts, coconut and dried cranberries. Divide the batter evenly among the two prepared cake pans. Bake at 350F until a thin knife inserted into the center comes out clean and the cakes have just started to come away from the sides of the pans, about 35-45 minutes. Allow cakes to cool in the pans about 10-15 minutes, and then run a thin knife or an offset spatula around the edges to loosen the cake form the pan. Invert cakes onto a cooling rack and peel off the parchment paper. Reinvert the cakes and let them cool completely, top sides up. In the bowl of a stand mixer using the paddle attachment, beat the butter on medium high speed until light and fluffy, about 2 minutes. Add the cream cheese and beat until combined and fluffy, about 2 minutes, scraping down the sides of the bowl as necessary. Beat in the orange zest and orange juice. Gradually add the confectioners' sugar and continue to beat until the frosting is smooth. Carrot cake with an ORANGE frosting?!?!??! Oh my, pure bliss. The texture of your carrot looks good. I made one too, but because I'm not keen on frosting, I covered mine with chocolate ganache! The texture of the cake looks really good. 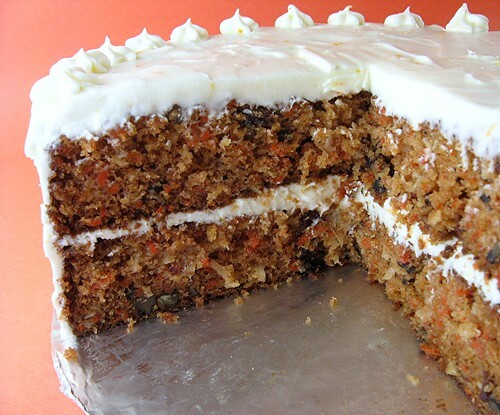 Sometimes, carrot cake can get so gummy with all the moisture. I've only tried CI's version, but wanted to give Dorie's a try too. The only thing about carrot cake is all the grating! Whew! I love, love, love carrot cake! This is so pretty! I haven't made carrot cake in a long while but love it! orange frosting you say? oh yes indeed! That's one beautiful carrot cake! I especially like the addition of orange to the frosting, as a little acid offsets the richness of the frosting, and like you said, brightens it. Well done! My husband was asking for a carrot cake for a while...I'll try your recipe. It looks so good! I like the orange touch on the frosting. Thank you! Looking for some inspiration for a Mother's day cake..This MAY be ideal! I will, no doubt, demonstrate my results on my blog. Gorgeous looking carrot cake, loving the orange cream cheese frosting. I like the tweaks you made to Dorie's recipe, especially the orange zest. I love carrot cake and this looks very pretty and delicious. Mmmm, carrot cake is my favorite! It sounds wonderful with the orange flavored icing. I love carrot cake, and this frosting is outrageous!!! YUM! The cream cheese frosting looks INSANELY good! I love to see a carrot cake that DOESN'T have pineapple in it. Who ever started putting pineapple in carrot cake anyway?? So, I made this beauty for a family dinner. It totally fell in the middle (my oven's been having issues and the difference in sea level from you to Idaho might have needed to be remedied) and I almost didn't take it. Good thing I did. The fruit pizza I made sat there like a bump on a log and the family literally fought over the last piece! What flavor and yeah for no pineapple! Wow!! Carrot Cake with orange zest an excellent combination. I am going to try this recipe. It will make an excellent cake at any party. That sure looks good! Would it be ok to reduce the sugar and replace oil with melted butter? 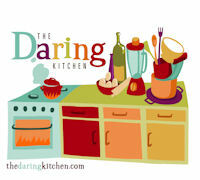 madhu - It's okay to replace to the oil with butter but a cold cake will be firmer than with oil. I've never reduced the amount of sugar used, so I'm not sure how that would affect the cake. Since sugar is a tenderizer and moisturizer, my guess is a less tender, less moist cake. 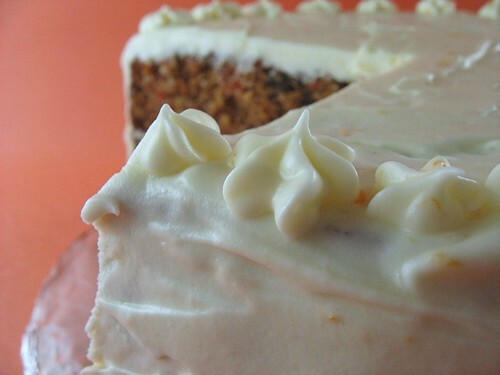 Beautiful carrot cake, one of my favorite choices! I'll have to bookmark this one. Love your blog. This is my 1st visit to your blog. can I share your recipes here with others in other website?